First, Beach… This scent is a duplicate of the Bobbi Brown scent of the same name and also reminds me of Coppertone Kids. This soap is luxurious, with a luscious lather and awesome skin-conditioning properties. It features a subtle light blue and light green swirl. The other absolutely fabulous soap I have curing for you is the latest batch of Patchouli. 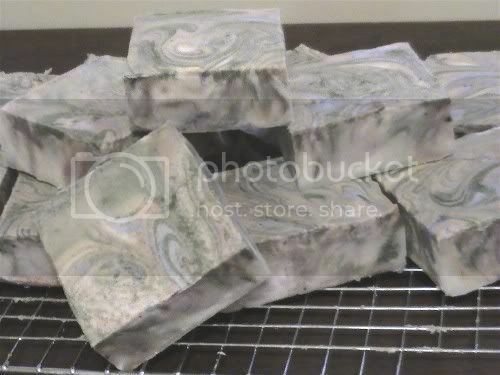 Scented with pure Patchouli essential oil, this soap features my most daring, ambitious swirl ever – and it rocks! I’m taking a creator’s pride in this one. Did you know that patchouli has aphrodesiac properties, making it a popular scent element in many perfumes? Beach will be ready 8 August 2009, and Patchouli can be yours on 15 August 2009. I have been fast and furiously doing some website improvements over the past few weeks, in addition to unpacking boxes and bags, keeping up with my very social little girl, obeying the various people who keep telling me to put my feet up and trying to do as much around the house as possible. You’ll notice it’s in the midst of a face-lift, though the work’s not completely done, yet. Just a few more changes to go, though, and hopefully they’ll be before the baby makes its grand debut. Besides the cosmetic appearance of my site, over the next week or so you’ll also see some new products going up and other products getting a new look. I’ll post here when those happen. *Sale prices apply to in-stock merchandise only. If you’re a soapmaker – or even if you’re a devoted hobbyist of another sort – you know that one of the greatest satisfactions for you is getting into your work or hobby, in creating once more. Three weeks ago, I HAD to make soap. I needed (and still do) to make soap to restock my inventory, but in the meantime, my desire was simply in making something for myself, in pushing the boundaries and in trying something new. That something new was lotion soap. I’d read about people making it, and I found numerous bottles of old lotion testers during the move that were too old to use as lotion, but that I couldn’t bring myself to toss out. One of those was Satsuma, a delish Asian tangerine fragrance that’s always been one of my favorites. I opted to hot process this lotion in the crock pot, for no other reason than my own impatience. Well, that, and we were getting low on soap for the shower. I was surprised to note that the lotion had managed to retain much of its scent, and my relief came when I discovered I had just enough Satsuma fragrance oil for the batch. It was a weird experience, mostly in that my soap seemed to seize in the crock pot, which is pretty much unheard of. Usually seizing happens in cold process and is often caused by reactions with particular fragrance oils. 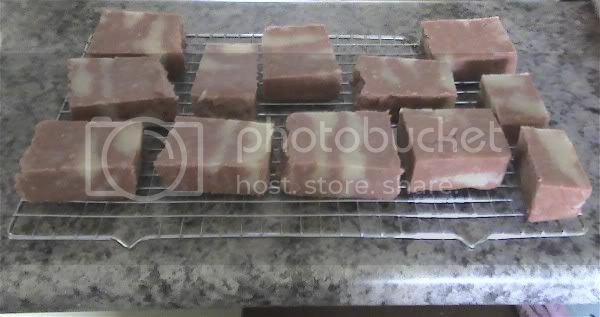 This soap was thick without added fragrance, with 10% extra water and a shorter cooking time. Regardless, I managed to get some color added and layered it in my mould – sort of – more like glumping layers. I’d hoped for a lighter orange, but my daughter was “supervising” and I was a little distracted when I was mixing up my colorant (a very child-safe process, by the way). My dearly beloved expressed his opinion of the moulded soap: “It looks like something the cat hocked up on top.” Um, thanks, darling. OK, so it did. Thankfully, it didn’t stay looking like that. 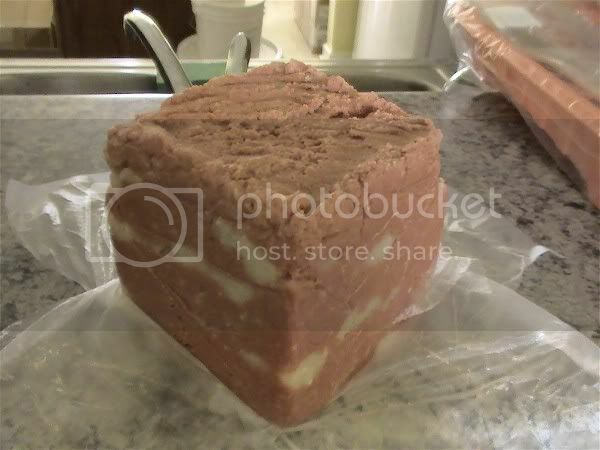 Here’s what that same soap looks like sliced. This first lotion soap was just for personal use, but look for other lotion soaps to come in the next few months. Sara’s Soaps ‘n Such has Moved! There comes a time in every family’s life – sometimes sooner, sometimes later – when the rental game is just not cutting it anymore and God presents the perfect opportunity to move. That happened to us last month. Well, obviously, when it comes to moving, it’s not just a matter of deciding one morning, “I don’t want to rent anymore” and then being in a new home the next day. Our process started in April. During my daughter’s Spring intersession, she and I spent a couple of days at the coast, desiring a change of scenery and wanting to get a jump on the house hunting. With the help of our lovely realtor Rebecca (with Coldwell Banker/Sea Coast Realty), we found this little gem in a town about half an hour from the ocean. The price was right (and got even “more right”), interest rates were still low and as several people said along the way as one thing after another just fell so easily into place, “God wants you to have that house!” Sure, there were a few people who were skeptical. We heard things like, “You’re being taken advantage of” and “This sounds too good to be true, and if it sounds too good to be true…” I can’t explain it, but even with all the nay-sayers and doubters, my faith stayed uncharacteristically strong. Several times my husband and I heard, “Why” this town? I can’t really explain it, except for the fact that this is where the houses were most affordable. It’s farther from the beach than we’d prefer, but it is still close to the beach. There’s no Target here, let alone a Super Target, and even people who live here wonder why we’d want to move out of Durham, which has everything as far as entertainment goes – theatre, concerts, minor-league baseball, shopping, movie theaters, restaurants galore and easy access to Raleigh (home of the Carolina Hurricanes) – to move down here, which has nothing without a half-hour drive. We say, “Well, the crime stats for the whole county for a year are equal to Durham on a weekend. Here we don’t hear sirens twice a night or gunshots.” All we’ve been able to figure out is, God has a reason for planting us here, so we’re going to bloom in the meantime. I’ve already used that crockpot to make one batch of soap, but that’s for another post. Posted on July 4, 2009 Categories Vintage Sara's Soaps 'n Such1 Comment on Sara’s Soaps ‘n Such has Moved!